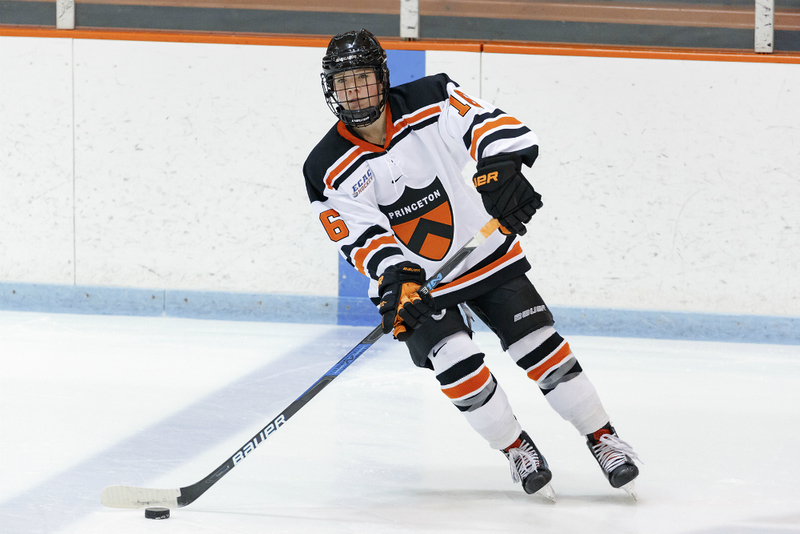 For 18 straight games, the Princeton women’s hockey team has answered the bell. When the Tigers have needed a goal, they’ve gotten one. When they’ve needed a big defensive stand or a sparkling save, they’ve gotten those, too. Their power play is clicking. Their goaltending has been outstanding. Their rookies have jumped into the line-up with ease. 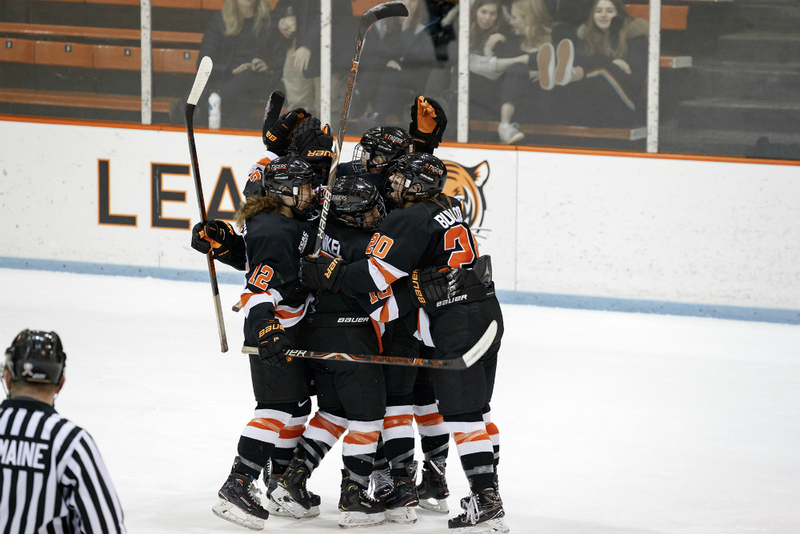 That’s all amounted to the country’s longest unbeaten streak—and the longest in Princeton women’s hockey history—at 18 games, and the highest national ranking ever for the program. The outlook for this season wasn’t always so bright. Princeton had a down year in 2017-18, finishing sixth in the ECAC standings and posting a 14-14-4 record. The Tigers had more depth coming into this year, but they had to reckon with a major injury early on, when former ECAC Goaltender of the Year Stephanie Neatby went down in the preseason. And they lost two hard-fought games to Wisconsin in their first weekend of play. But since then, game after game, the Tigers have pieced together a run that solidifies them as a favorite to win the ECAC and to compete nationally come March. Their rise this year has largely been a surprise—Princeton was unranked coming in, and did not break into the top 10 until Nov. 19. So at what point did head coach Cara Morey know that her team was a real contender? Lund is in fact a senior this year, and Morey is in her second year as head coach; prior to 2017-18, she spent six seasons on the Princeton coaching staff, as an assistant and then associate head coach. So three years ago, when she made her prediction, she knew who the Tigers were recruiting and how each class would stack up come this year. It didn’t all come together so easily at first. After then-head coach Jeff Kampersal departed for Penn State two summers ago, Morey said taking over as head coach was a little bit of a tricky transition. She was no longer the associate head coach; she was at the helm, and there was an adjustment period both for herself and her players. But since then, Morey has fostered a shift in mindset for the Tigers, and the effects so far have been enormous. From her perspective, the turnaround started last season in the midst of a difficult year, when the team sat down and outlined their goals for the second half. The Tigers made it a goal to become .500, because at the time, the team did not have a winning record. They achieved that. They said they wanted to beat Clarkson, then the No. 1-ranked team and the eventual national champion. The Tigers crossed that one off, too, with a 2-0 victory over the Golden Knights at Hobey Baker Rink last February. Setting out and reaching those goals last year is what laid the groundwork for success this season. When Neatby suffered an injury before the Tigers had even played a game, some growing pains in net might have been expected early on; they probably would have held the team back a bit, too. But sophomore goaltender Rachel McQuigge made sure that didn’t happen from day one. She’s posted a 1.61 goals-against average and a .937 save percentage, which rank seventh and eighth in the country, respectively. With Neatby now back in the line-up, the two netminders are still splitting time in the crease, a testament to McQuigge’s convincing play. Princeton’s dominance as a whole this year hasn’t just come down to one or two players, or one area of the game, although some standout individual performances have certainly helped. McQuigge’s play is in that category. Two players on the top line—junior Carly Bullock and freshman Sarah Fillier—rank in the top-10 in the country in points per game. Their linemate Maggie Connors, also a rookie, is tied for 19th. On the blue line, junior Claire Thompson is third in points per game among all defenders nationally. Their individual success has translated to more production throughout the rest of the line-up, too. The Tigers rank fourth among Division I schools with 3.70 goals per game and 35.50 shots on goal per game. Princeton’s power play is even more elite, converting on 25.9% of its chances, which is second only to Wisconsin. “We can draw up anything we want and try to make it as complicated or as simple as coaches, but when you have players that can execute the way that our power-play players can execute, they’re dangerous,” Morey said. In fact, she says this year’s team features “some of the most offensively gifted and talented players that I have ever worked with,” which is high praise considering Morey’s coaching career has involved stints with Canada’s Under-18 and Development Teams, as well as the national team’s most recent Fall Festival. Despite their youth, Fillier and Connors are firmly among those impressive offensive talents already. It can be incredibly difficult for any rookie to jump into the pace of the college game and make a difference right away, but they both have earned their spots on the top line for the No. 4 team in the country. Fillier made her senior team debut with Team Canada at just 18 years old at the 4 Nations Cup in November, and she’s been lights out since coming back from Saskatoon. She is the only player in the country right now who’s scoring at a two-points-per-game clip. Her twin sister, Kayla, also plays for Princeton. When the Tigers next take the ice on Tuesday, Jan. 29, against Penn State, they’ll put their unbeaten streak on the line again. But Morey doesn’t want her team’s focus to be centered on the lofty expectations that come with maintaining such a run, however long it lasts; that’s a surefire recipe for mistakes and missed chances. Just as they’ve done all year, she wants to see them take it one game at a time, and ultimately work on the task at hand before moving on to what’s next.